According to the 2017 Cybersecurity Jobs Report, there will be 3.5 million cybersecurity job openings by 2021. At the same time, it is also predicted that the global expenditure for cybercrime will rise to $6 trillion annually by 2021. The steep rise in cybercrime begs the question: can the cybersecurity industry keep up with the demand for security specialists? As the rate of cybercrime rises dramatically, organizations across all sectors and sizes are having a difficult time hiring cybersecurity professionals, although that may be due to the inability to attract more young people to the field. Although there is a general belief that HR cyber recruiters often look for candidates with at least a diploma or degree in IT Security or something similar, many organizations are exploring “new collar” jobs that don’t require traditional cybersecurity education. These jobs, valuing skills, knowledge, & willingness to learn are a step in the right direction for those looking to switch careers or get an entry-level position. So how can a cybersecurity hopeful get started in the industry? Tier-I Analysts are often expected to deal with various technologies and environments so when it comes to progressing in their careers, they have a much better idea of what they want to specialize in. This provides them with a really strong foundation for moving into a client-facing role, or honing their technical skills in a service-oriented technical role. Internships can also provide a lot of hands-on training for students looking to enter the cybersecurity industry. At Herjavec Group, we are dedicated to developing cybersecurity talent within Canada by participating in Ontario’s TalentEdge Internship Program (TIP). This program allows post-secondary students and recent Masters graduates to work on research and development projects for some hands-on industry training. Read more about Herjavec Group’s involvement with the program here. To encourage more students to join the cybersecurity industry, Herjavec Group recently visited students at Fleming College to speak about the opportunities in the cyber industry, our global Security Operations Centers (SOCs), and what it means to work in a high-paced environment. Taylor Robinson, a Technical Services Lead at Herjavec Group and a Fleming College alumnus, spoke to the students about the role, responsibilities, and what it takes to succeed in such a fast-paced industry. 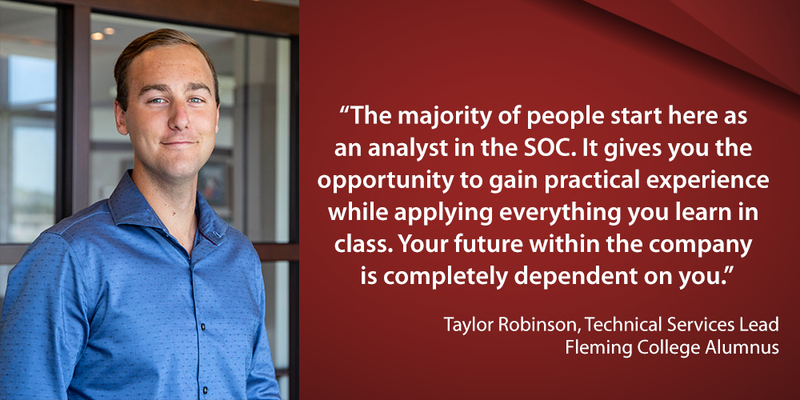 Taylor, who started at Herjavec Group as a co-op student finishing his last year at college, has been with the company for over 2 years and has progressed significantly in such a short period. In 6 months, he became a Shift Lead in the SOC and after one year at the company, he was promoted to a Technical Services Lead position. “Your future within the company is completely dependent on you,” he told the Fleming students. At Herjavec Group, we expect that as an employee progresses in their career, they want to be challenged and mentored. So what are some of these opportunities? For those interested in pursuing a career in cybersecurity, it’s important to note that there are really three core skills necessary to be successful in cybersecurity: having attention to detail, being analytical, and having a constant desire to keep learning. If you are a driven individual, seeking a fast-paced, innovative firm to support your success; this industry is for you. Learn more about Herjavec Group career opportunities in sales, technology, marketing, and operations here.